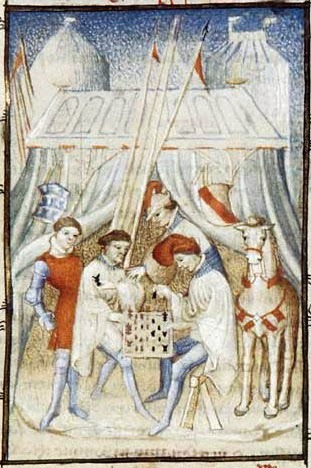 This is the third post in a series on medieval chess. 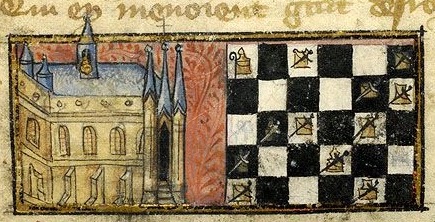 Chequered and unchequered, or different colours are not the only chess board variations found in medieval manuscripts, as shown in a previous post. Also variations in the number of squares are found, i.e. boards not consisting of 8 by 8 squares. It is unclear whether these are mistakes made by the artists or due to restrictions of the image size. Otherwise, they may show variations in the game of chess, with more (new) or less game pieces. 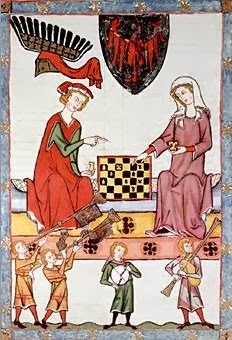 Some larger medieval chess boards are known, for instance the popular medieval courier chess which uses a board of 12 by 8 squares, decimal chess on a 10 by 10 squares board, or grande acredex on a 12 by 12 squares board. 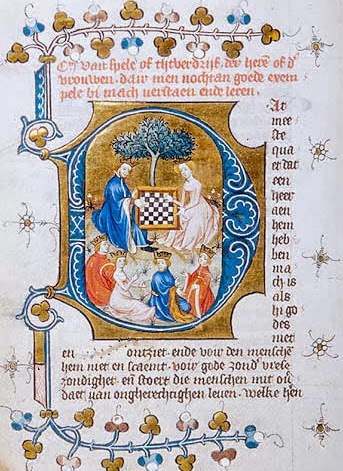 Below, I will show many boards from medieval illuminations that have some deviation from the 8 by 8 board. The only correct 8x8 chequered board on this blogpost with white and red chess pieces in the starting position. 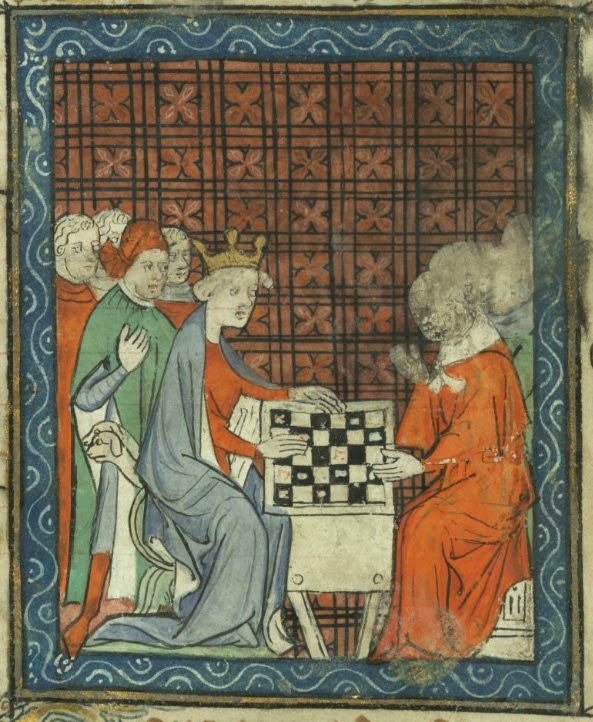 'Recueil de parties et problèmes d'échecs': (Collection of games and problems of chess) by Nicholes of S. Nicholaï of Lombardy, Gieu of the eskies. Manuscript copied and painted in Paris, early 14th century. 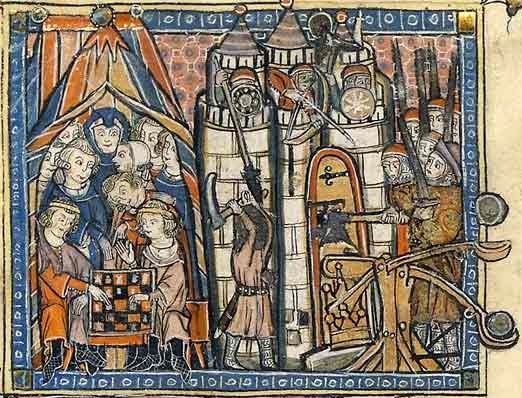 Bibliotheque Nationale de France, Paris, manuscript Fr. 1173 folio 3. The 'collection' of faulty chess boards is divided into three parts: chess boards that are larger than the normal 8 by 8 squares, chess boards that are smaller than 8 by 8 boards, and those that are very small: the 5 by 5 and 4 by 4 square boards. The chess boards do not have to be square, they can also be rectangular with one of the sides having more squares. It then depends whether the game is played over the smaller or longer side of the board. Two of the boards that are more frequently shown are a 6 by 6 chequered board and an 4 by 4 board (see table below). Perhaps they represent some unknown chess variants? 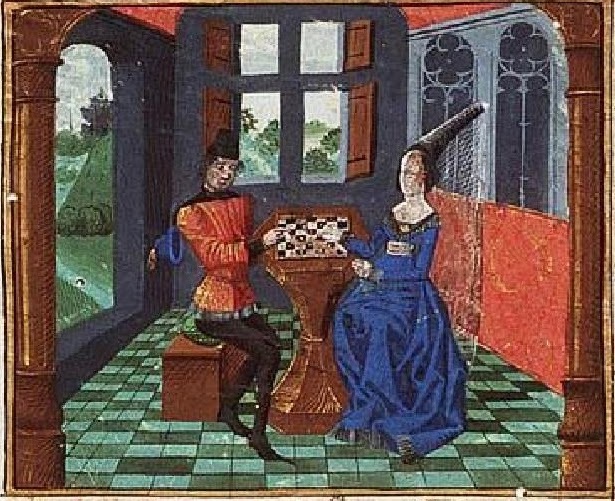 A man and a woman playing chess on a 10x8 chequered board. The game is played over the long side, shown by the position of the board between the two players. Jacques de Cessoles. Le Jeu des échecs moralisés. Bibliotheque Nationale de France, Paris. Manuscript Fr. 24274, fol. 37v, 15th century. Two larger chess boards: an 9 by 8 board on the floor and an 8 by 10 board in the hand of one of the brawlers. 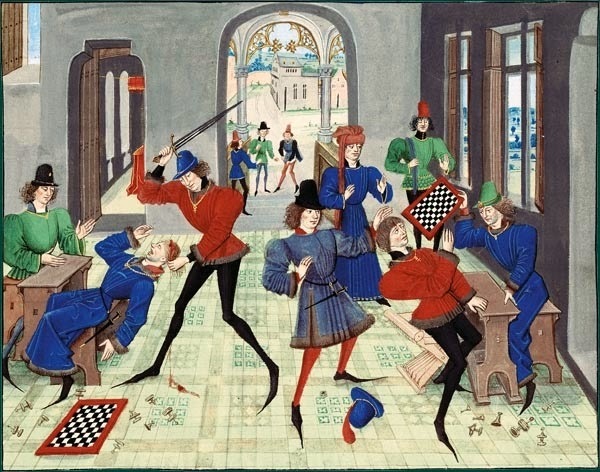 'Partie d’échecs dégénérant en assassinat' in the book Renaut de Montauban. Manuscript made in Bruges, between 1462-1470. Bibliotheque Nationale de France, Paris. Manuscript, Arsenal ms. 5073 rés. folio 15. 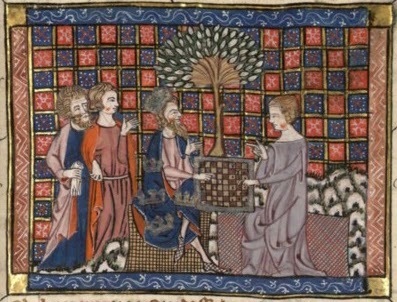 Alexander and one of Candace's followers play chess on a 9 by 8 chequered board. La prise de Defur. Bibliotheque Nationale de France, manuscript Fr. 12565, folio 69. 14th century. 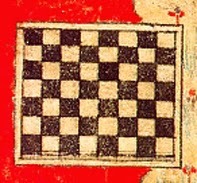 A red and grey chequered 12 by 7 chess board. 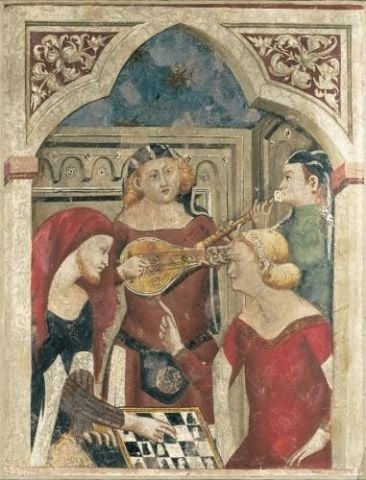 A tempera painting on a panel of a cassone by Liberale da Verona (Italian, Verona) made around 1475. Measures 34.9 x 41.3 cm. Metropolitan Museum of Art, New York, USA. A couple plays chess or checkers on a 6x6 unchequered square board. The Queen Mary Psalter, British Library Royal 2 B VII, fol. 198v, around 1310-1320. A 6x6 chess board on a table. 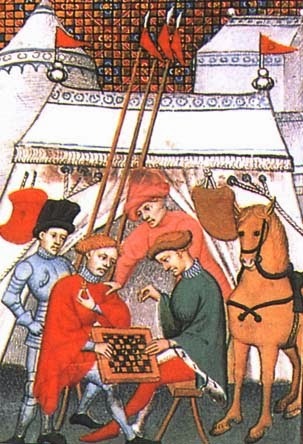 Schachzabel, early 15th century. The 7x8 chequered magical flying chess board of Walewein.Walewijn. 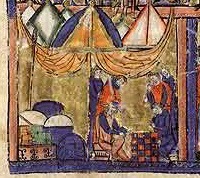 Detail of an miniature from the 13th century manuscript Ms. Letterk. 195-2. Leiden University Library, Leiden, the Netherlands. A 5x5 chequered board. 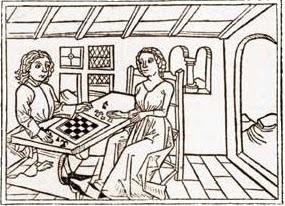 Marguerite d'Alençon and her brother François d'Angoulême playing chess. Échecs amoureux. Bibliotheque Nationale de France, manuscript Fr. 143, fol. 1, c. 1496-1498. 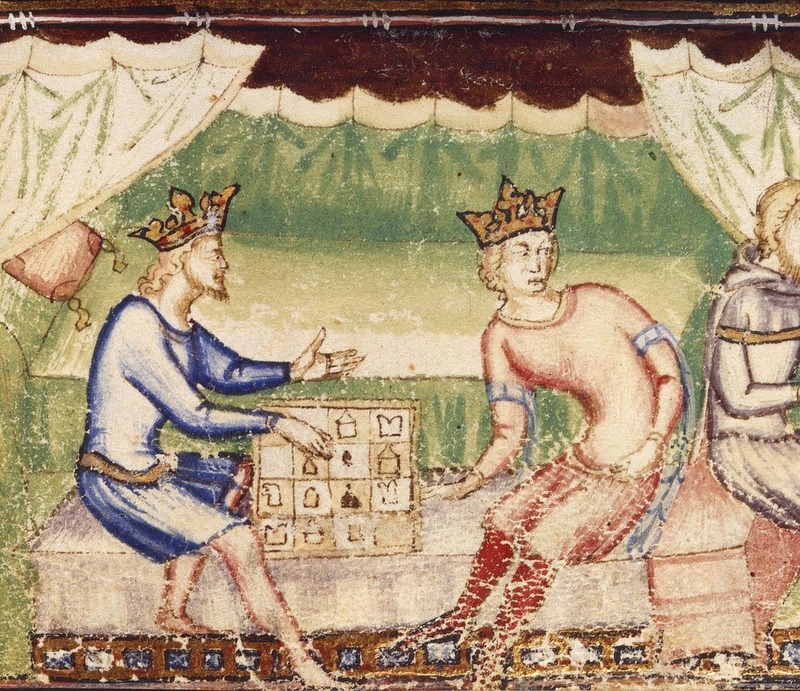 Chess played on a 7x6 chequered board by Otto IV, Margrave of Brandenburg (1266-1308) with his wife. Codex Manesse, Heidelberg, Germany, folio 13r. Chess being played on a 7x7 chequered board. Dirk van Delft - Tafel er Kerstenre Ghelove (1400 - 1410). This book happens to be written in old Dutch: "En van 't spele of tijdverdrijf de here of d'vrouwen, daer men nochtan goede exempele bi mach verstaen ende leren." Morgan Library, New York, NY, USA, manuscript M681 folio m131v . Bibliotheue Nationale de France, manuscript Fr. 97, folio 57v), first quarter of the 15th century. 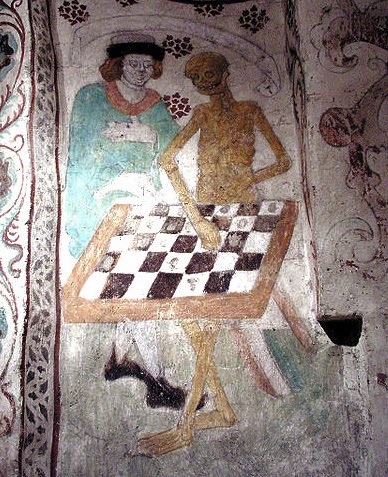 Fresco of a man playing chess with death by Albertus Pictor around 1480. Täby kyrka, Täby, Sweden. Only two chess table legs are shown on the right. The chess board is 7 by 5 squares. Chess played on a 7 by 5 chequered board, played over the long side. 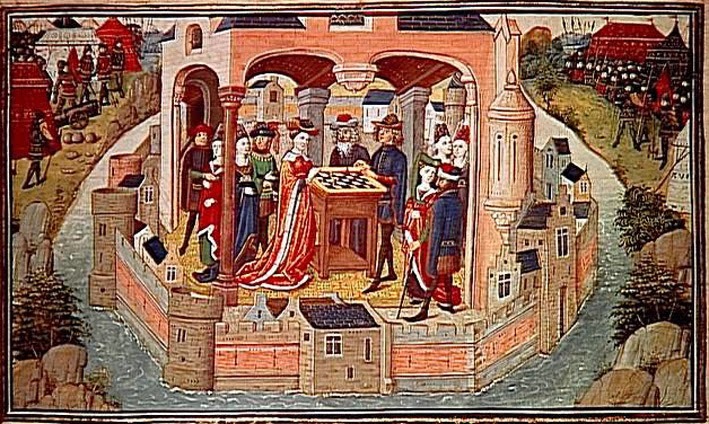 Cassiel and Phesona play chess, The Romance of Alexander. Bibliotheque National de France, manuscript Fr. 790, fol. 125. Between 1301-1400. 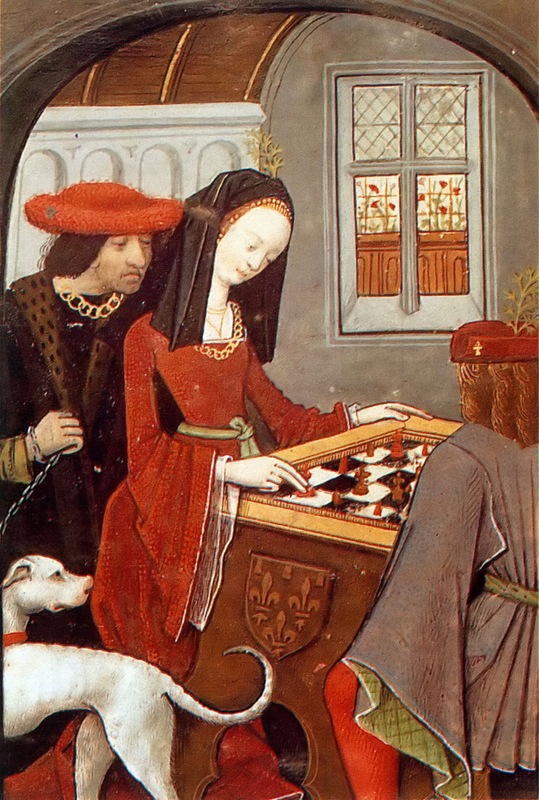 Cassiel and Phesona play chess on a 7x8 red and gold chequered board. La prise de Defur. Bibliotheque Nationale de France, manuscript Fr. 12565, folio 78v. 14th century. manuscript KB 71 E 49 folio 9r. Made in France, around 1470-1480. 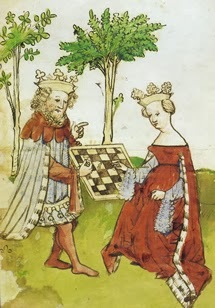 A king and queen playing chess on a chequered 6x7 board. Das Schachzabelbuch, 15th century. British Library, London, UK, manuscript Add. 11616, folio 5v. A game of chess on an 8x7 board. 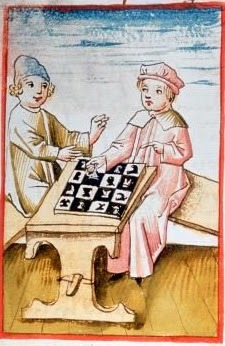 Liber de ludo scaccorum, beginning of the 15th century. Bibliotheque Nationale de France, manuscript Fr. 1172, folio 1. 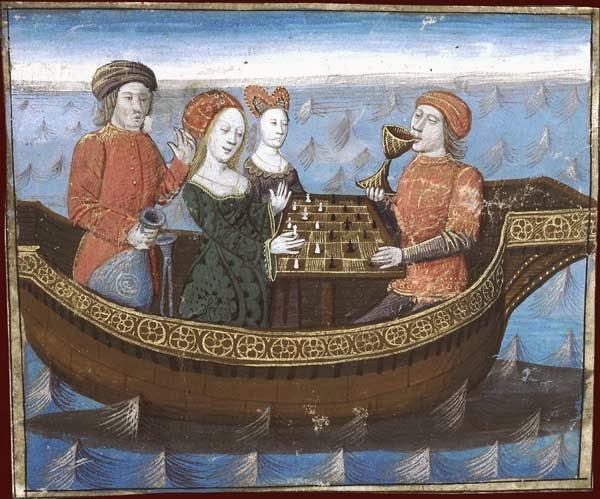 Odysseus plays chess on a 7x7 unchequered board. Christine de Pizan, Épître d'Orthéa. 15th century, Bibliotheque Nationale de France, manuscript Fr. 606 folio 39. An 7x5 chequered chessboard. 'Le Livre des Conquestes et Faits d'Alexandre', by Jean Wauquelin. Illustrated by Willem Vrelant Mid-15th century. Manuscript LDUT00456, Musee Petit Palais, Paris, France. An 6x6 chess board hanging on the wall. 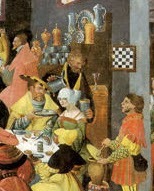 Detail of a 15th century painting. 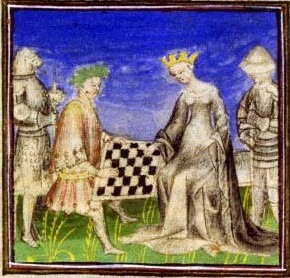 Lancelot brings a magical chessboard to Queen Guinevere. It is indeed a magical board as the 7x6 board on the left, transforms itself into a 6x6 chess board on the right. The board is blue and yellow chequered. 'Le Roman de Lancelot du Lac'. Pierpont Morgan Library, New York, NY, USA. Manuscript M. 806 folio 253. 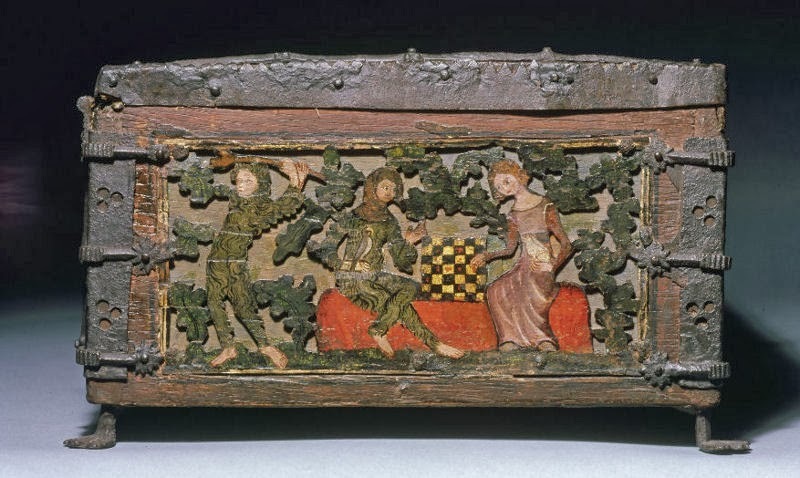 From Northern France, early 14th century. Chess is played on a 6 by 6 and a 6 by 5 chequered board. 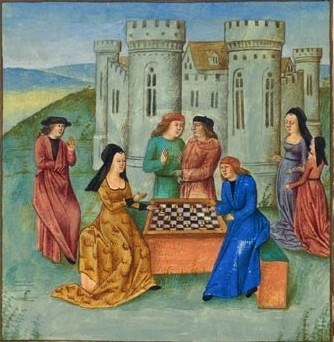 Le Jeu des échecs moralisé by Jacobus Cessolis, 1365. University of Chicago Library MS 392, images from folio 1r and 32r. 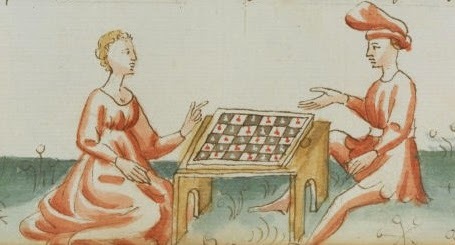 A Minnekästchen where the lovers play chess on a 6x6 black and yellow board. Made between (1351-1375) at the lower rhine area. Museum fur Angewandte Kunst, Cologne, Germany. Some other sides of this casket can be found on my minnekastchen post. Tristan and Isold play chess on a 6x7 chequered board (and drink the love potion). Tristan de Léonois. Messire Lancelot du Lac, de Gaultier de Moap, 1470. Bibliotheque Nationale de France, Paris, Manuscript Fr. 112 folio 239. 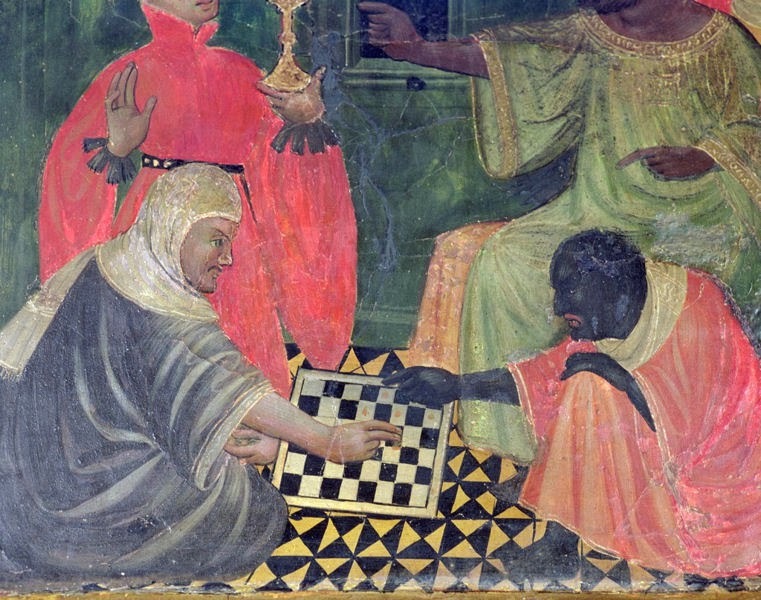 A Moor and a Christian playing Chess on an 8x6 chequered board. 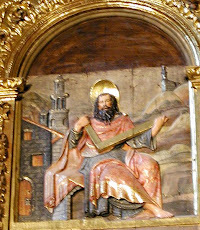 Detail of the altarpiece of the San Nicholas church, Mallorca? 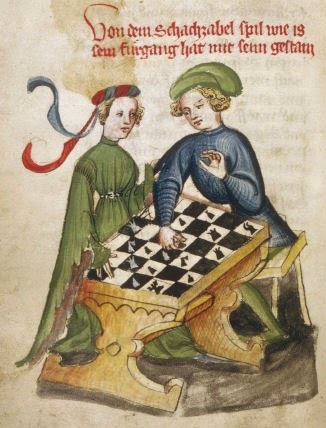 by the Master of Castellitx between 1415-1440.
perhaps this is more an alquerque-like game. Decameron, made in 1432. Bibliotheque Nationale de France, Paris. Manuscript Ars. 5070, folio 260v. 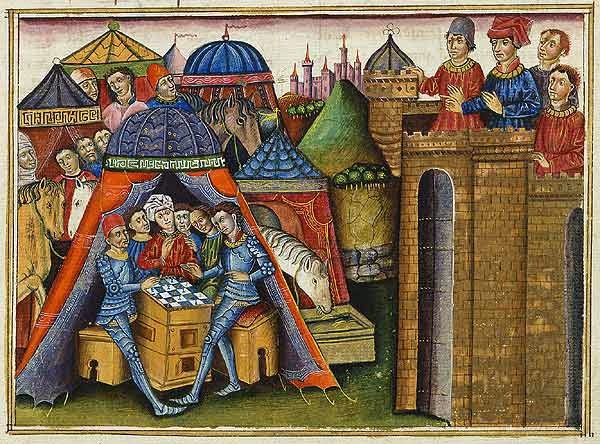 Achilles in his tent with an 6x6 chequered board. Histoire ancienne jusqu'à César. 14th or 15th century. Bibliotheque nationale de France, manuscript Fr. 301 folio 111v. 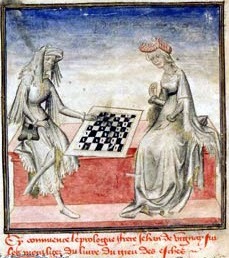 Xerxes and Evil-merodac play chess on a 6x6 board. 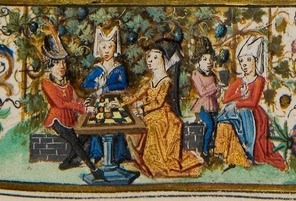 Le Jeu des echecs moralisés by Jacobus de Cessulis. Bibliotheque Municipale, Dijon, France - ms. 0268. First half 14th century. Garin playing chess on a 6x5 board. However if you examine more closely, you find the pieces more resemble game pieces for draughts. Also the board is completely filled with the tablemen. Chansons of the cycle of Guillaume d’Orange. British Library, London UK, manuscript Royal 20 D XI, folio 1. First quarter of the 14th century. 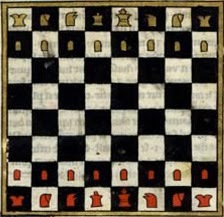 A miniature with a 6x5 chessboard from the Pelerinage de la vie humaine. Pierpont Morgan Library manuscript M.1038, folio 077v. Northern France, 1325-1349. A game of chess on a 6x6 board. Liber de Moribus hominum, 14th century. Bibliotheque Nationale de France, manuscript Fr. 1165, folio 2v. 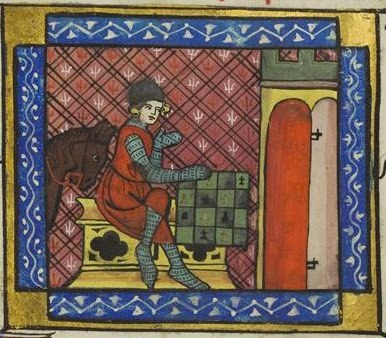 Ulysses plays chess in his tent on a 7x7 board. L’Épître Othéa. British Library, London, UK, manuscript Harley 4431, folio 133. Around 1410-1414. 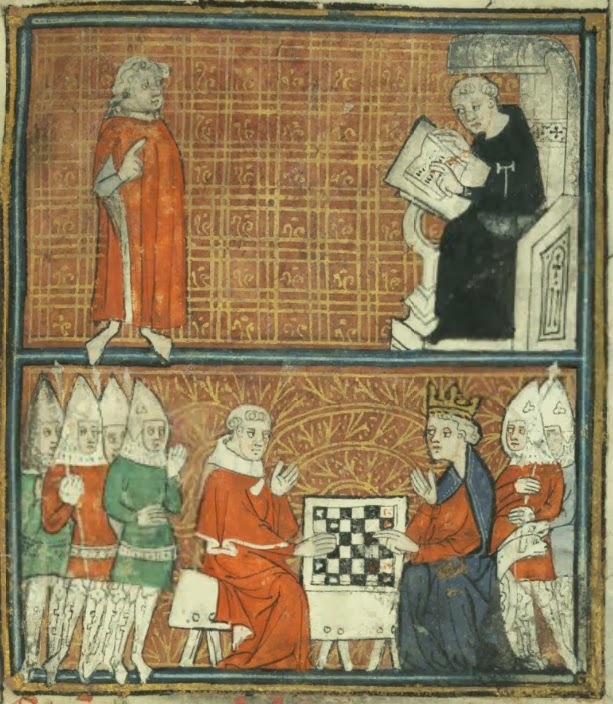 Several chess games appear in the base-de-pages of the Romance of Alexander (Bodleian Ms. 264), c. 1338-1344, most of the boards are incorrect. Bodleian Library, Oxford, UK. 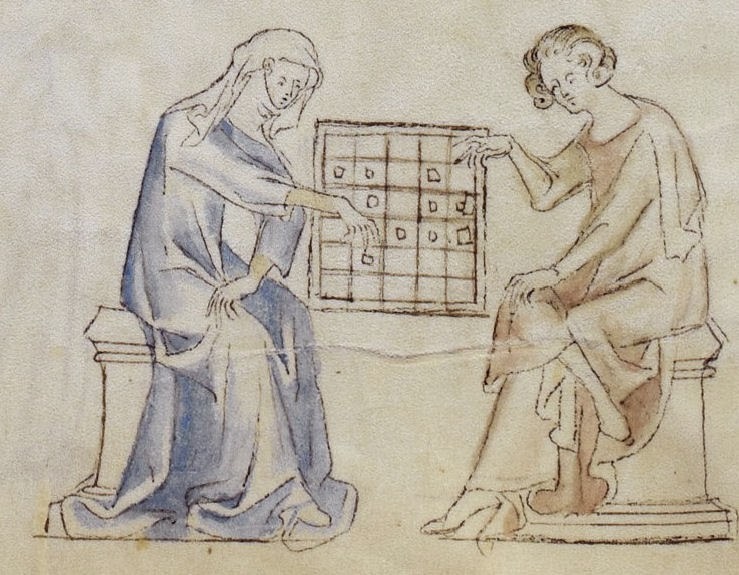 This is the most curious of the chess boards in the Bodleian Ms. 264 manuscript, folio 92v. Below the 6x6 chequered board, the outlines of another - correct 8x8 - board are shown! 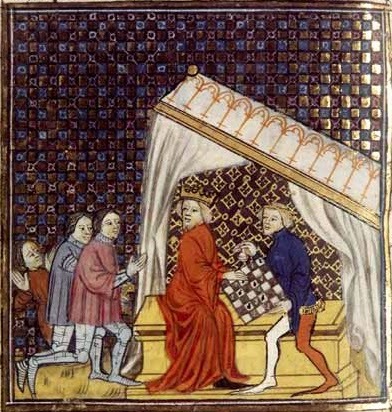 For what reason did the illuminator change his mind to present a faulty chess board? Another 6x6 board, with two chess players accompanied by a peacock and a dog. Folio 121v. A 6x5 gold and black chequered board. Folio 60r. 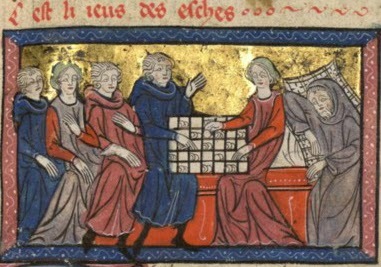 A group of 5 players with an 7x7 black and yellow chequered board. Folio 126r. Made in France between 1320 and 1329. Pierpont Morgan Library manuscript M.0754, folio 033v. A 4x5 chequered chess board. 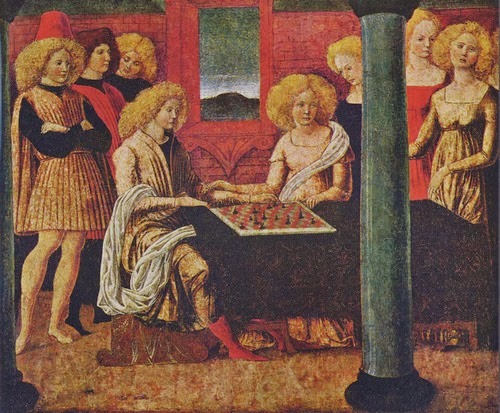 Das Goldene Spiel ('The golden game') by Maître Ingold, made in Augsburg in 1472. Bibliotheque Nationale de France, Manuscript Imprimés Rés. y2. 281. 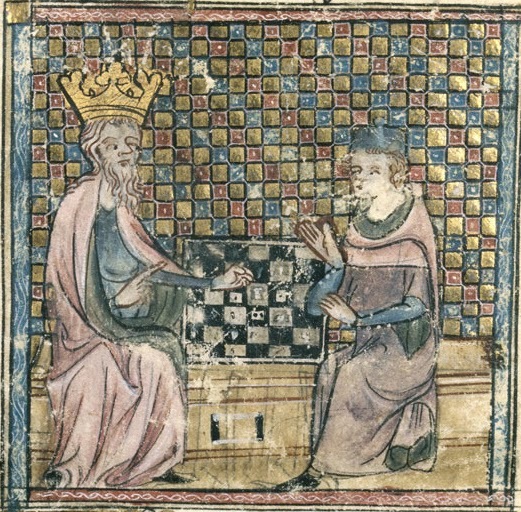 Two kings play chess on a 4x4 board. Roman du Roy Meliadus de Leonnoys. Made in Naples, Italy around 1352. British Library, London, UK, Manuscript Add. 12228, folio 23.
late 14th century from Bergamo, Italy. Size 26.4 x 20.1 in. / 67 x 51 cm. The knight Cifar observes the enemy camp where chess is being played on a 4x5 blue and white board. Roman du chevalier Cifar. Castille, Spain, 14th century. Miniature by Juan de Carrion. Bibliotheque National de France, Paris, Manuscript Esp. 36 folio 19. Chess on a red and black 5x5 chequered board. The crusaders refuse to do battle. Guillaume de Tyr, Histoire de la guerre sainte. Northern France, early 14th century. Bibliotheque Nationale de France, Manuscript fr. 2824 folio 94v . Bibliotheque Nationale de France, Paris, Manuscript Fr. 12558 folio 143v. 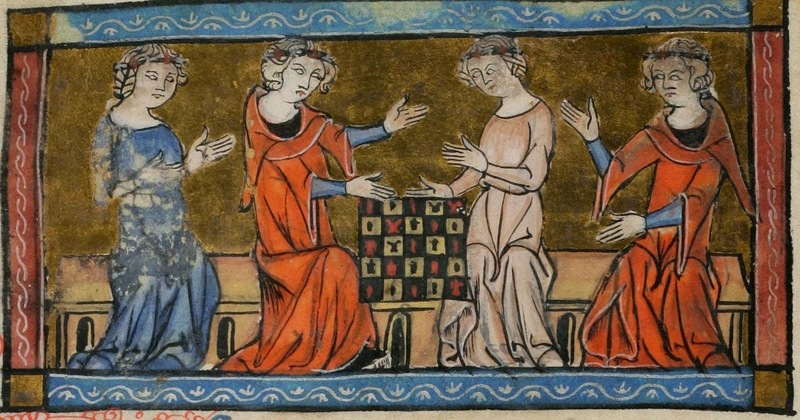 This 4x4 board is from a copy of the Voeux de Paon, made in the mid 14th century according to the clothing style. New York Public Library, New York, USA. Spencer Collection Ms. 009 f. 17r. An 4x4 or 4x5 chess board. 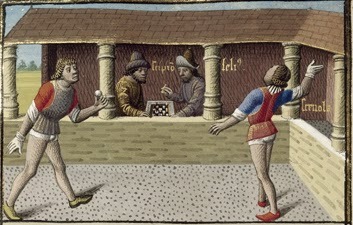 Miniature from an unknown manuscript, the style suggests Italian? 14th century. 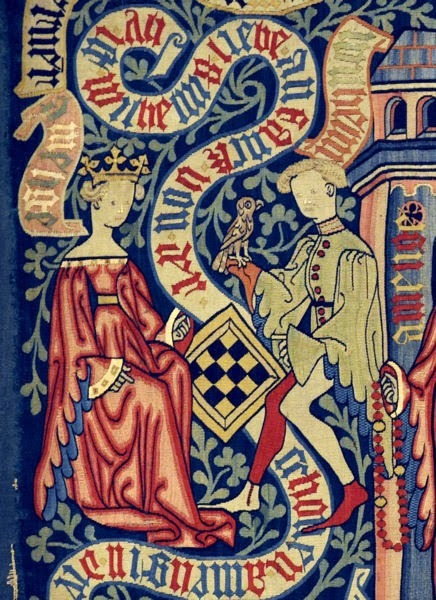 daughter of the English king. Made in the mid-Rhine region between 1410-1430. 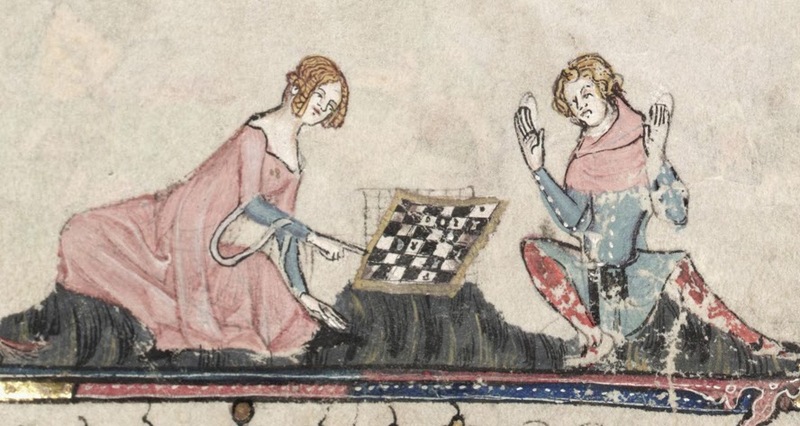 Phesonas and Cassiel playing chess on a 5x5 blue and gold chequered board. Manuscript of Jacques de Longuyon‘s poem 'Les Voeux du Paon', around 1350. Morgan Library, New York, NY, USA, manuscript MS G 24. Folio 025v. 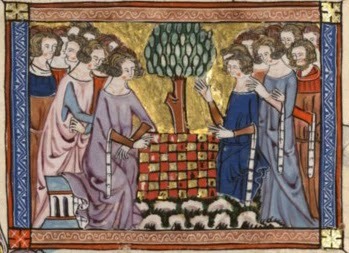 Chess game on a 5x5 board, completely filled with chess pieces, between Fézonie and Cassïel le Baudrain. Les Vœux du paon (The Vows of the Peacock) by Jacques de Longuyon. Foundation Martin Bodmer, Cologny, Switzerland, manuscript Cod. Bodmer 189, folio 49r. Around 1310. Chess on 4x5 blue and white coloured chequered board. Miniature from an unknown manuscript.. Chess on a 4x4 green-grey chequered board. Both black and white have 5 game pieces. Miniature from an unknown manuscript, early 14th century. Two men playing chess on a full 4x4 chequered board. Schachzabelbuch, around 1464/1465. Österreichische Nationalbibliothek, Vienna, Austria, manuscript Cod. Nr. 2801 Folio 52r. Scipio and Leulius playing chess on a 4x5 board. Les Fais et les Dis des Romains et de autres gens. British Library, London, UK, manuscript Harley 4375, fol. 151v. Around 1473-1480.
and of course all the famous libraries with medieval manuscripts available online. Saint Thomas is one of the 12 disciples of Jesus and is also known as doubting Thomas. He is the patron saint of architects and woodworkers/carpenters, which is explained by the apocryphal legend. This legend of Saint Thomas relates that he was sold by Jesus as a slave to a South-Indian king, who wanted to have a palace built. 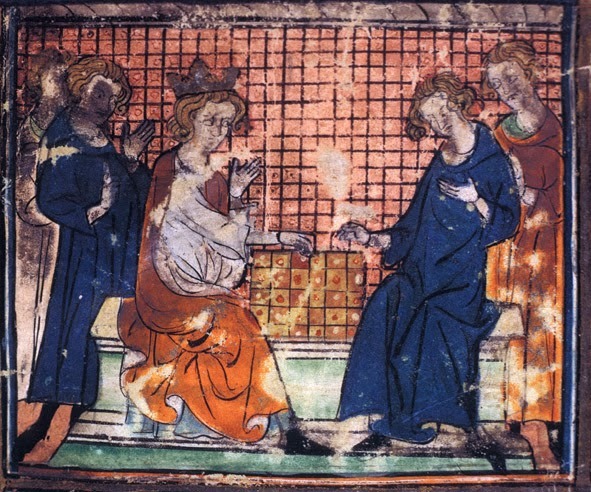 The king gave massive amounts of gold to Thomas for his castle, but he distributed it to the poor. When the king learned of this he was angry and wanted to execute Thomas. However, the Kings brother, who miraculously had returned from death, intervened and told the king that he had seen an enormous palace in heaven. When he asked to whom this palace belonged, he was told that it belonged to his brother, the King. Upon hearing this Saint Thomas was released. Saint Thomas is frequently depicted with a square or a compass as these are the tools of the builders, and with a spear (signifying the wound in Jesus side where doubting Thomas laid his hand in, or the spear that caused his death as a martyr).